DISCLAIMER: [Editor's Note] Spartantown relies on the generosity of independent comic book publishers to provide review copies in order to post reviews. Thanks to companies like Image Comics, Valiant Entertainment, Archie Comics, Dynamite Comics, Black Mask Studios, Action Lab, and occasionally others, I've had access to some wonderful stories that otherwise I would have missed. I don't get review copies from mainstream publishers like DC Comics and Marvel so this "Best of..." list is far from comprehensive but a good sample of the best stories I've had access to over the year. 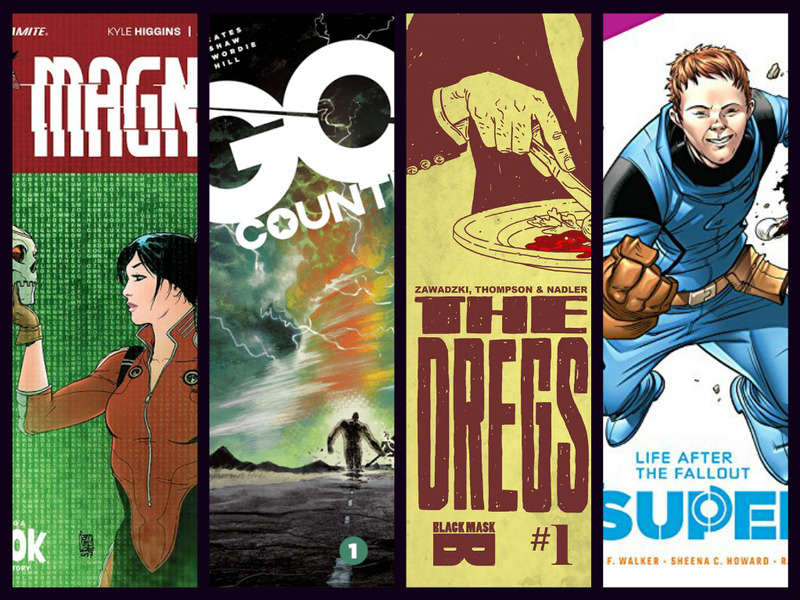 If you haven't read some of these comics please consider giving them a chance. Do humans dream of owning electric sheep? Artificial intelligence, rather than becoming our overlords, have settled into an uneasy symbiosis with humanity - they work for us as our colleagues and servants, earning vacation time they spend in a boundless digital universe running on human-maintained server farms. BONUS TUROK STORY! The all-new saga of the all-new Turok continues: He's a man on a mission, possessed, and he won't let anyone or anything get in his way! Leave it to writer Kyle Higgins to reinvent Dynamite's Gold Key series "Magnus: Robot Fighter" into a female psychologist aiding AI androids who serve humans. Dr. Kerri Magnus uniquely traverses both the human and digital world and when an android murders its human masters, 'Magnus' becomes one of the most gripping detective stories in science fiction. 'Magnus' is a provocative and intelligent sci-fi drama that has a lot on its mind. 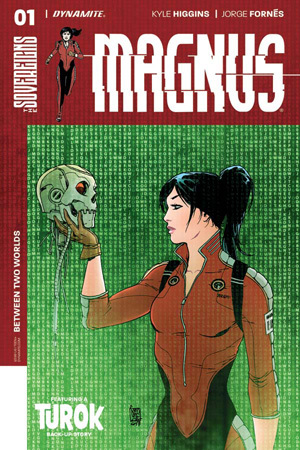 Higgins establishes this futuristic tale with precision and intrigue while Jorge Fornes and Chris O'Halloran paint a grounded story with some effective android designs. Kerri Magnus is the latest and greatest iteration of the Magnus title and this worthy successor is our avatar to a strange new world where only robots dream. 180ish pages of full-color comic-booking about friendship, family, growing up, and grand larceny from rising star writer Matthew Rosenberg (WE CAN NEVER GO HOME, KINGPIN, SECRET WARRIORS) and equally rising star artist Tyler Boss (LAZARUS, CALEXIT, Vice Magazine). This volume collects the complete series that Kieron Gilled (THE WICKED + THE DIVINE, DARTH VADER) described as "Imagine Tarantino does Goonies. And excellent." and Brian K. Vaughan (SAGA, Y THE LAST MAN) said was "Exploding with ambition and love of the medium!" 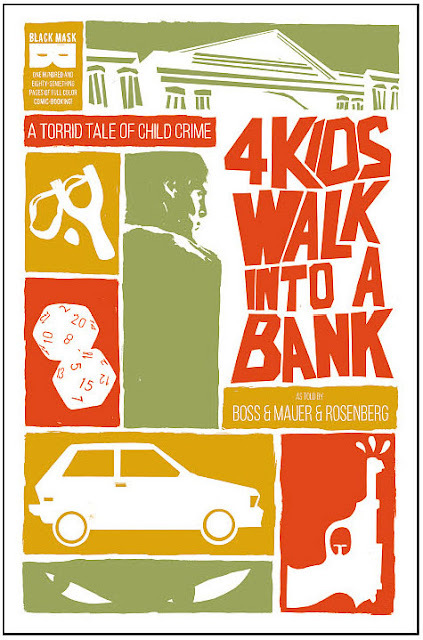 In a time when adventures starring kids is hot again, '4 Kids Walk Into a Bank' is one of the hottest in comics. Just like the popularity of 'Stranger Things' and 'It' revolves around the resiliency and daring of teens and preteens, Matthew Rosenberg's and Tyler Boss' amateur thieves are no different. '4 Kids' is darkly funny and thoroughly entertaining as Paige recruits her nerd friends in pulling off a bank job before her dad and former partners get a chance. It's an amusing cat and mouse game as Paige tries to gather the intel while planning the heist. If you love the equally excellent 'Paper Girls' from Brian K. Vaughan and Cliff Chiang, 'Goonies,' or 'Stand by Me' then you'll understand the beauty of this smash hit from Black Mask Studios. 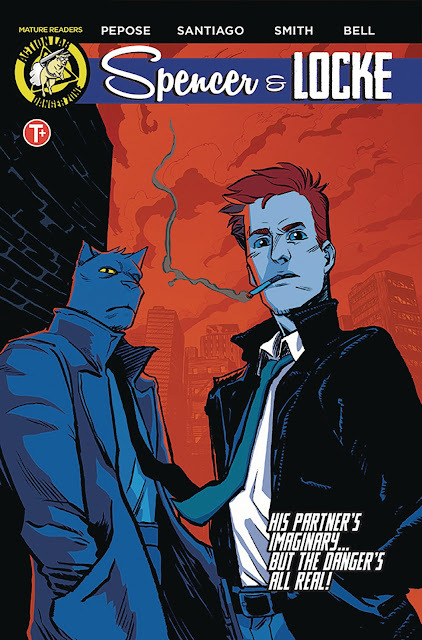 Collecting the hit mini-series, Spencer and Locke follows hard-boiled Detective Locke as he investigates a brutal murder with the strangest of partners - his childhood imaginary panther, Spencer. But when they face brutal gunfights, deadly car chases and memories of Locke's traumatic upbringing, can this unlikely pair survive long enough to find the truth? I'll admit the premise of a gritty detective comic with a bizarro version of Bill Waterson's beloved comic strip, Calvin and Hobbes, seemed cute but I wondered how it would it translate? Luckily, David Pepose, Jorge Santiago, Jr., and Jasen Smith proved that the detective with the imaginary panther was simply a vehicle to expose some real-life trauma. They were able to give this seemingly fun gimmick actual depth and layers of poignancy that elevated this dark exciting tale into one of the most unexpected reads of the year. Natasha Alterici is a passionate creator. 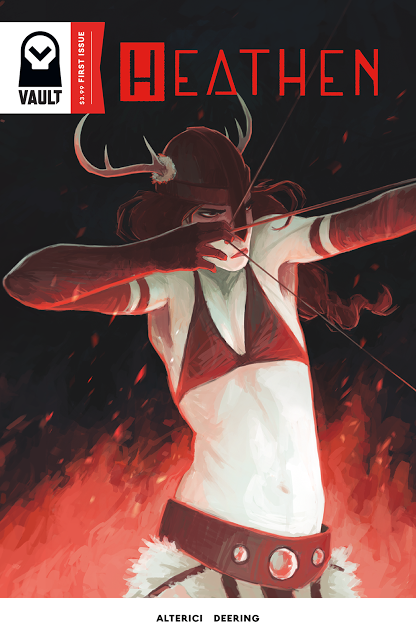 Her passion for 'Heathen' is undeniable and indelible with every word and illustration. She made storytelling look easy as her Viking Aydis defied her people to set her own path and change the world for women. Alterici effortlessly made us love Aydis as the strong-willed and independent warrior looking to free women of the chains that bind them. This seemingly straightforward adventure tale has layers to it that address patriarchal societies, sexual identities, discrimination, oppression, and equality. It sounds like it could be some heavy-handed topics but Alterici's approach is so fluid and seamless, such ideas are woven into the fabric of Aydis' journey without weighing it down. MATURE READERS “No Crime Goes Unpunished. No Criminal Walks Away.” The death of a friend catches sixteen year -old Addison off guard, but a chance encounter with his killers on the subway forever changes her life. Crime cover-ups, dirty cops, and magical dead boyfriends consume her life as she’s thrust into the vigilante lifestyle and murder. One of the most underrated mature books over the last two years ended its run in 2017. 'Tomboy' turns the magic girl trope on its head by making it a horror fantasy that is brutal and riveting. It's one big conspiracy that Addison is thrust into when her family lineage is revealed and the death of a friend puts her on a path of bloody revenge. Mia Goodwin provides the initial art for her script before giving way to Michelle Wong's excellent clean lines. The beauty of the art juxtaposed with grisly violence adds to the dichotomy of the series. It subverts the whole idea of girl magic being completely innocent and fun. Addison's life is forever changed, sadly in many ways, evolving into a monster she never asked to become. Valiant comics is by far the most cinematic publisher of comics. Any number of titles from its line could have made this list. Ninja-K, Secret Weapons, Bloodshot, or Rai all offer some huge action movie moments that can simply be jaw-dropping to witness on the page. 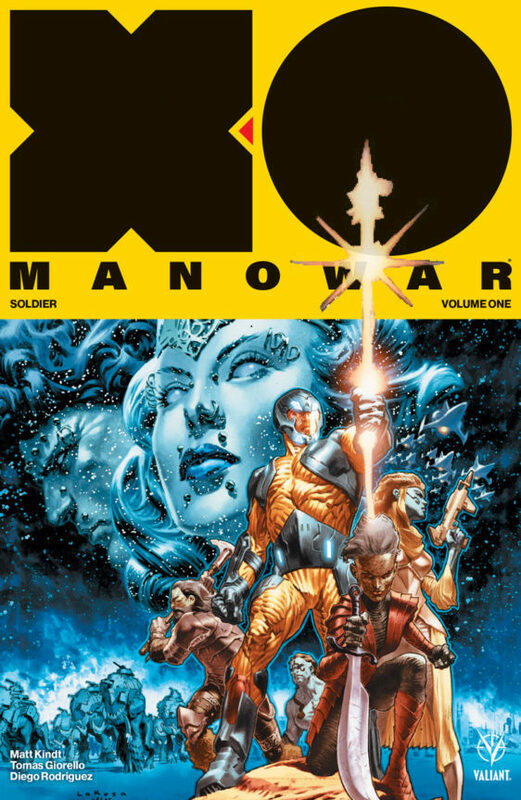 But it's the work of Matt Kindt and Tomas Giorello on "X-O Manowar" that has pumped new energy and life into a character that traditionally depended on his suit for powers. Instead, Kindt showed why Aric the man was so special. He's forced to fight and his military brilliance springs him into action leading the charge and moving up the ranks albeit reluctantly. Each issue is a blockbuster action film worthy of the big screen. It's an entertaining sci-fi fantasy that rivals just about anything playing at your local cinema. One of the year's most thought-provoking comic series was another Black Mask Studios title. 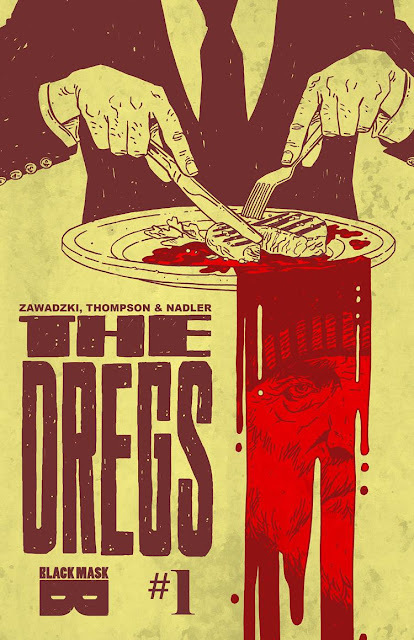 'The Dregs' shed light on the homeless situation in Vancouver and how they're being driven out by gentrification. Zac Thompson, Lonnie Nadler, and Eric Zawadzki frame this all-too-real topic through the eyes of a homeless man caught up in a mystery. The story opens with the cannibalization of his friend by a local trendy restaurant that they serve to the patrons. It's a heavy-handed metaphor but it gives way to an intriguing and poignant story steemed in classic pulp noir. Arnold's love for Raymond Chandler fuels his mission to find his missing friend throughout Vancouver. Along the way, Arnold battles his addiction, faces discrimination and finds gentrification squeezing him out of downtown. Zawadzki's visuals create a dizzying maze that Arnold has to navigate and some of the most innovative layouts seen in comics this year. In GOD COUNTRY, readers meet Emmett Quinlan, an old widower rattled by dementia. Emmett isn't just a problem for his children—his violent outbursts are more than the local cops can handle. When a tornado levels his home—as well as the surrounding West Texas town—a restored Quinlan rises from the wreckage. In GOD COUNTRY salvation is a double-edged sword. ATOMAHAWK, INTERCEPTOR) give or take so choosing one for the list was inevitable and challenging. 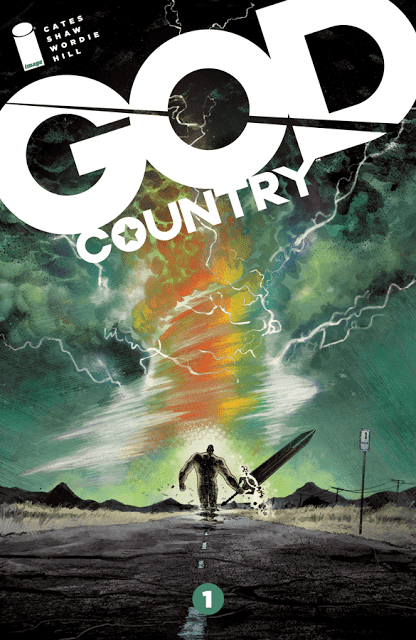 It was his Image Comics book 'God Country' that gets the nod for its simplicity and audacity. A high-concept fantasy grounded in its humanity. Emmett Quinlan is too much for his son's family to handle. His dementia has sadly made him unruly and hard to control. A widower whose mind had been ravaged by Alzheimer's Disease finds rejuvenation when a tornado lands him a magical sword from another realm. Suddenly, Emmett's strength is restored but more importantly his mind is made whole. He recognizes his family again and memories of his dearly departed wife return. This magical sword had vanquished his disease but only while he's holding it. Of course, the otherworldly owner wanted his sword back and despite sending warriors to retrieve it, Emmett wasn't about to give it up without a fight. What ensues is a gigantic battle between a determined man (a Texan no less) and gods illustrated in epic fashion by Geoff Shaw and Jason Wordie. There are some earth-shaking confrontations tempered with Emmett's unyielding desire to hold on to his memories, his mind. Here's a man, a relatable figure to any of us with an aging parent, desperate to retain a life's worth of memories especially of those he loved. How hard would you fight to hold on to them? How hard would your parent? It's that connection that makes this fantastic story hit home for the reader. After the Earth survived annihilation from an asteroid which was destroyed by a group of heroic astronauts, the resultant meteor shower turned Youngstown, Ohio, into a Level 5 impact zone. After a Columbine-like incident in which a superpowered teenager exploded and killed other youngsters, the Foresight Corporation took over Youngstown to find and regulate any other teenagers with emerging powers. Kayla Tate has returned to Youngstown because her parents are scientists for Foresight. Kayla has reunited with her childhood friend, Jonah Watkins, a young man with Down syndrome. Kayla and Jonah are learning about each other again, as a mysterious new superhuman named Cosmosis has become the Internet sensation as the hero of Youngstown. Kayla discovers that Cosmosis . . . is Jonah! Based on his favorite comic book hero, Jonah is using the secret powers he gained from the meteor shower to help people and fight bad guys. To protect Jonah, and discover the sinister mysteries of her town, Kayla uses her own powers gained from a meteor fragment to fight alongside Jonah as the hero Amina. 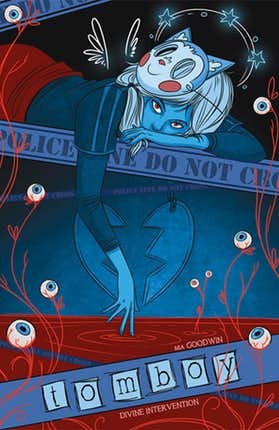 When Amina and Cosmosis discover that young superpowered people are being kidnapped and trained to become Earth's best line of defense against the possibility of an alien invasion, the two teenage heroes use their abilities to stop Foresight, all the while helping each other navigate through resentment, naivete, and the awkward steps of rekindling their friendship. I was only privy to the first three issues of 'Superb' from Lion Forge Comics. Actually, it was the only comic made available to me by the publisher but it really is an entertaining series. One that features lead characters that rarely headline a superhero comic anywhere else. Jonah, a teenager with Down syndrome and his friend Kayla, an African-American girl, acquire special powers from a mysterious asteroid. They team together against the nefarious Foresight Corporation who gather and train kids with emerging powers. Its place on this list is as much about the quality of the series by David Walker, Sheena C. Howard and Ray-Anthony Height as it is about Lion Forge's commitment to real diversity in comics. "As a company committed to “Comics for Everyone,” we strive to publish titles that reflect the diversity of our world in the characters, the creators, and the Lion Forge team, and to create content that is just as original," reads as part of the company's mission statement. 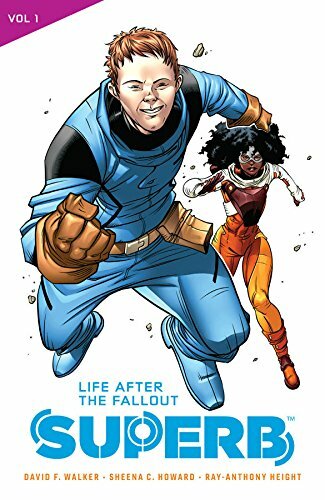 Senior editor Joseph Illidge has this to say to the Washington Post,"What attracted me to the job was, as an alumni of Milestone Media, I have always in my career in comics believed in the promotion of people from different backgrounds as creators through fiction." So far Lion Forge's superhero universe known as Catalyst Prime features heroes that are black, Latino, women, and disabled. The diversity doesn't end at the page but also includes writers and artists. While mainstream publishers are paying lip service to diversity Lion Forge is leading the way in making comics more inclusive.